FREE Kris Kindle Here in Time For Christmas? I was in the Oak Brook Barnes and Noble two days ago and there was a Nook demo happening on both floors! At least a dozen people had Nooks in their hands. The Nook costs $149. I had a minor rant about the Kindle commercial that came out last fall. It suggested that $139 was a steal for the Kindle because a character had paid more for sunglasses. Ranting aside, price is relative. $139 is a steal for some. A free Kindle is truly a steal for anyone. Is it on it's way? 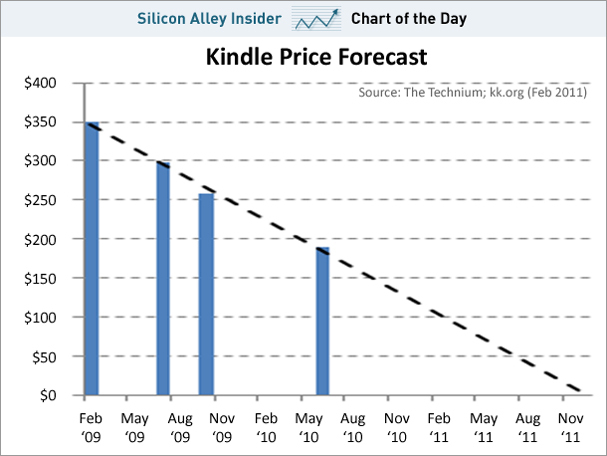 Unlikely for everyone, but for select customers, throwing in a free Kindle may be on the horizon by November. Going back to my Barnes and Noble experience: Putting eReaders in people's hands is what it's all about. At Amazon, if someone buys a lot of books, so many that they get free shipping, then giving them a Kindle is the next logical step. Last year, close to $1 billion in ebooks were sold. By 2015, expectations are $3 billion. With 47% of the current ebook market, Amazon is in a prime position to package free Kindles into premium programs, which will maximize ebooks sales. 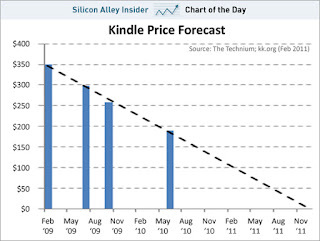 When asked by author Kevin Kelly about the price projections on the above chart Amazon CEO Jeff Bezos "merely smiled and said, 'Oh, you noticed that!' And then smiled again." Barnes and Noble has the physical location to do demos, but with only 4% of the ebook market and with the overhead of their stores cutting into profits, a free Nook seems unlikely in the near future. So come Christmas 2011, Kris Kindle may come down the chimney with a free eReader, but definitely not St. Nookolaus! Tomorrow morning my alarm will go off at 6:30AM. Rise and shine and open wide: time to get my tooth pulled! Tooth 31 (the victim of an old filling) will be extracted from my mouth at 8AM. 9 weeks into turning forty and I'm losing a molar. I don't think yank a tooth is 1 of the 40 things listed to do when you turn 40! Life could be worse for me though and is worse for a good portion of America and indeed, the world. I'm full-time as a waiter in a busy restaurant and a I'm a 10 plus year employee. I'm taking 5 vacation days off for my oral surgery. I was able to pick up President's day lunch shift to earn some extra cash before my days off. (Incidentally President Washington had about half his permanent teeth left at my age. Ouch!) My work insurance will cover the majority of anesthesia, extraction and pain killer costs. I'm going with Tylenol-Codeine, but everyone says go for the Vicodin. I welcome your comments as to the drug pros & cons. Not bad benefits for a waiter. I'm doing okay for an actor who was then a massage therapist (equine & equestrian message no less) and now has followed the dream of writing in the wake of the not so horse-massage-friendly recession. I work full-time, mostly doubles and I typically get 3 days off to write. I'll have this full week off to write. I live less than forty miles from the Wisconsin border where the Governor is trying to crush unions. The national unemployment rate is 9.8%. People are being sued for medical debts. People are hungry. John Scalzi's online essay Being Poor puts everything into perspective with many lines beginning with Being poor is... This line struck me: "Being poor is hoping the toothache goes away." Google me - I dare you! Keith Heimpel. I'm not famous - nobody is googling my name and there's no content out there outside of what I create. But go ahead and do it anyway! My author platform will come up. when someone searches your name. Sometime in the future, I'll be a published author. In my case it'll be for short fiction (I've thrown down that gauntlet - my short fiction will be published in 2011) and I'll get traffic because my blog will come up, on the 1st page of Google, along with my Facebook page and my tweets. My readers will easily connect with me. Now at this future point I'll have a website, KeithHeimpel.com, which at present forwards to this blog. I have no fiction credits right now so I don't feel the need for a website. But why have the domain name? I've secured my name as a domain name, so I'm ready for business. Imagine getting published and then trying to secure your name as a domain, only to discover it's taken. When was it taken - last week? Doesn't matter. It's gone. The same goes for Twitter. Although it's hardly a common name, I know of at least one other individual named Keith Heimpel and he might want to brand himself. How dare he! Once I've got some fiction credits, I'll compete for search rankings with those periodicals where I've been published, then Amazon.com, then reviews, etc. Why not dominate page 1 of Google now, while it's easy? Your readership will then find it easy to connect with you and buy your fiction through your venues. Any works by Keith Heimpel or any guest author on keithheimpel.blogspot.com are licensed under a Creative Commons Attribution-NonCommercial-ShareAlike 3.0 Unported License. I feature books and tools to fuel your writing & feed your reading habits. Some of it I've chosen - some of it's random ads, generated by my content. Using your library card? Mine's on fire! The Chick Hatching Project is Back! Dresdenficathon Signups Close This Week! Keith Heimpel. Ethereal theme. Theme images by peeterv. Powered by Blogger.